This item is from the mid 90s. Rare original Playstation logo keychain. Playstation logo keychain unique design. US Seller! Unique designed Playstation ® logo keychain. Made from eco-plastic. 3D printed. This item was obtained at the Sony PlayStation booth at E3 in Los Angeles, California. It is brand new and has never been used. Please review the pictures I have taken to show you the exact item you will receive. I do combine shipping so please request shipping total before paying. Thanks for looking. The sleek black design takes its inspiration from the later generations of the popular PlayStation console. Numskull PS4 Playstation 4 Keychain Key Chain Key Ring RARE!!! Numskull PS4 Playstation 4 Keychain Key Chain Key Ring RARE!!!. Condition is New. These are SUPER RARE and the only ones on Ebay. Brand new and wrapped up with a clear cling on the shiny part of the top of the console. This will complete your Numskull keychain collection! Ni No Kuni 2 Keychain Lofty Limited Run GameStop Promo PS4 Sony Playstation. Condition is New. Shipped with USPS First Class Package. You have a chance to buy PlayStation Loot Collectors. The box is open and everything inside is still sealed and never used. The box does have wear and tear on it as well at the plastic that's crack where its housing the mug. PlayStation 4 Blue Silicon Flexible Key Chain! PS4 Collectible!! 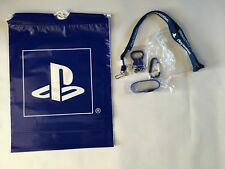 PlayStation Brand New never used key chain The lisitng is for 1 key chain The item is approx 4.25 inches long and 1/2 inch wide Perfect to wear around wrist SUPER GIFT IDEA FOR ANY VIDEO GAME FAN AWESOME to Carry KEYS to the POOL Thank you very much in advance!. 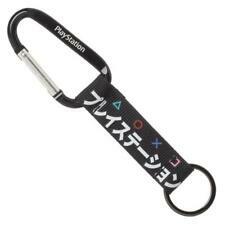 PlayStation Vita Carabiner w/keyring. PlayStation Lanyard. PlayStation 4 Keychain holds 4 keys and bottle opener on one end. The Ultimate PlayStation Collector's 'BLUE BUNDLE' PlayStation 4 light up silicone bracelet. This is a rare promo from the original Playstation. Sony PlayStation 989 Sports Locker Room Challenge Key Chain! SUPER RARE!! The lisitng is for 1 Sony PlayStation 989 Sports Locker Room Challenge Key Chain. 989 Sports. These were distributed during 989 Sports Events in the early 2000's. Unique toys, clothes for everyone, books, collectibles, and so much more.Anything under the sun! Great thing to put your keys on and then wear it on your wrist so you don't lose your keys! They are made out of a rubber/silicone type of material. We do not accept P.O. Boxes. Nice Gran Turismo keychain/ring for the GT collector! One side has the GT lettering and the other side has the PlayStation BUG/P symbol etched into it. Very nice quality keychain. We're happy to help. Picture is of actual item. There is a small opening in the plastic bubble portion that is difficult to see in the pictures. There is battery feature but it is most likely dead due to it being so old. Matching ink pen that you can hang around your neck, which is a 'break-away' for safety reasons. We're happy to help. PlayStation Loot Collectors Box Mug Metal Bottle Opener Keychain Pin Badge . Condition is New. Shipped with USPS First Class Package. SONY PS4 PLAYSTATION 4 PROMOTIONAL COLLECTORS LANYARD & KEYCHAIN HOLDER NEW 23"
3 piece God of War bundle for the PlayStation God of War fan! We're happy to help. Item is in used condition, but original PlayStation Designed by Numskull Loot Collectors Box (No Keychain Included) ingood condition! 1 PlayStation Mug. (No Keychain Included). Starhawk keychain brand new. If you have any questions please feel free to contact me. PlayStation Loot Box. A5. Condition is New. PlayStation Plus Lanyard. Little Big Planet 3 Lanyard. Gran Turismo Lot Playstation 2 Cloth Banner approximately 82"x 31" the psp banner has a little slit in left corner on bottom see picture otherwise both in great condition,brand new ps3 XL edition Gran Turismo 5 game sealed and 2 Gran Turismo prolouge games one from scea and other from japan, brand new key chain, never opened collectors edition Nissan car, adult size hat that is adjustable never worn. I have more pictures but unable to post all will send you more if interested in lot. Please feel free to contact me if you have questions. Thanks for looking! The only way to carry your keys. SONY PLAYSTATION. :: MATERIAL: HAYWARD LEATHER :.